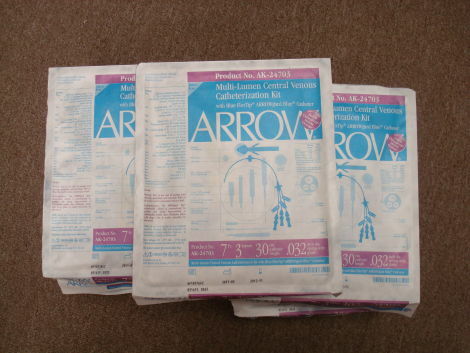 Arrow offers the broadest range of central venous access catheters in the industry. Pioneering innovations like ARROWg+ard® antimicrobial infection protection, Sharps Safety components, Arrow Raulerson Syringe and Blue FlexTip® are just a few of the features that make Arrow the most trusted name in venous access. The third lumen is used For administration of hyperosmolar solutions, measuring CVP, haemodialysis, plasmapheresis, rapid infusion of fluid among other uses. It is available in twi sizes: 7Fx16cms , 7F x 20cms.